Coronation Street actor Alan Halsall has revealed that he has turned to the gym since splitting from his wife Lucy Jo Hudson. In fact, the soap star spends so much time working out that he burns thousands of calories a day. He even admitted that he can put himself through two punishing workouts in just one day – which explains why he has shed so much weight over the last few months. 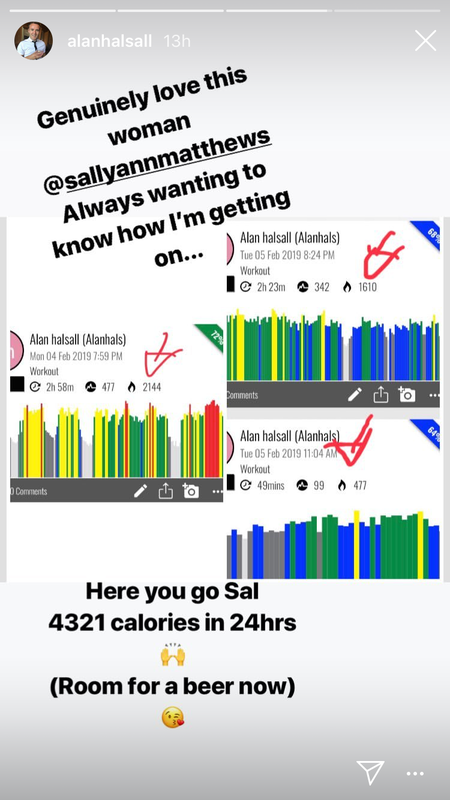 Sharing his progress on Instagram, Alan revealed that on Monday night he worked out for nearly three hours and burned 2,144 calories. And then on Tuesday he smashed two workouts in just the morning alone, spending close to two and a half hours exercising which burned 1610 calories. He then trained for another 49 minutes and worked off 477 more calories. The average daily intake for a man is 2,500 calories. Alan’s increase at the gym comes after his former co-star and estranged wife revealed that she is in love with new man Lewis Devine, just eight weeks after calling time on her marriage. The pair met while Lucy was starring as the lead role in a panto show of Snow White and the Seven Dwarfs, while Lewis played the character’s pal Muddles. “Lucy-Jo and Lewis shared an instant ­chemistry, but obviously she was married and didn’t act on it,” a source revealed to The Sun. “After trying for months, she and Alan called time on their marriage and something slowly developed with Lewis. They went public to their friends with their romance a few weeks ago and attended a wedding of one of Lewis’s relations together, but the news has been hard for Alan to take,” the source continued. The publication even went on to reveal that the Corrie actor is “gutted” his wife of nine-years has moved on, while he remains single.